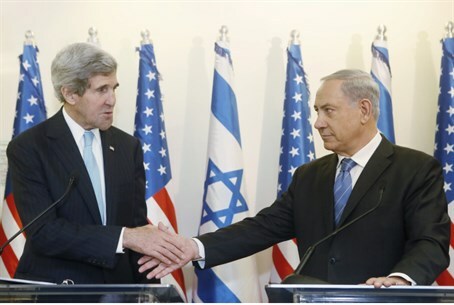 Netanyahu speaks with Kerry, says yeshiva boys’ disappearance directly related to Hamas-Fatah unity. Prime Minister Binyamin Netanyahu spoke on Friday evening with U.S. Secretary of State John Kerry, following the disappearance of three yeshiva students near Hevron. During the conversation, Netanyahu told Kerry that the boys’ disappearance was directly related to the Palestinian Authority (PA) signing a reconciliation pact and forming a unity government with the Hamas terrorist group. "What is happening on the ground since Hamas was added to the government is a deterioration of the situation. This is the direct result of allowing a murderous and racist terrorist organization into the government," Netanyahu told Kerry, according to Channel 2 News. Netanyahu also reiterated that Israel holds PA Chairman Mahmoud Abbas responsible for the three students’ disappearance and possible kidnapping. The conversation between Netanyahu and Kerry came after Justice Minister Tzipi Livni met Kerry in London and asked him to help in the search for the three yeshiva students. A senior State Department official told The Associated Press that Kerry called Abbas to talk about the missing teenagers. Netanyahu also spoke to Foreign Minister Avigdor Liberman, who is currently on a diplomatic visit to Africa, and briefed him on the situation. Meanwhile, security forces are continuing the search for the missing students. IDF Spokesman Motti Almoz said on Friday evening that the IDF and the entire defense establishment were doing everything in their power to locate the three missing students.